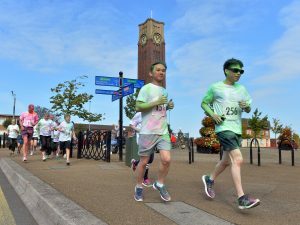 In September 2017, Coalville was covered in colour for the second successful Coalville Colour Run. And now it’s back. Get the date in your diary: Sunday 16 September 2018. Make sure you get your place this year – 1,000 places are now available. Register for the fun run here. Organised by local domestic abuse charity Living Without Abuse as part of NWLDC’s Choose Coalville campaign, this colourful event also helps to raise valuable money for charity.